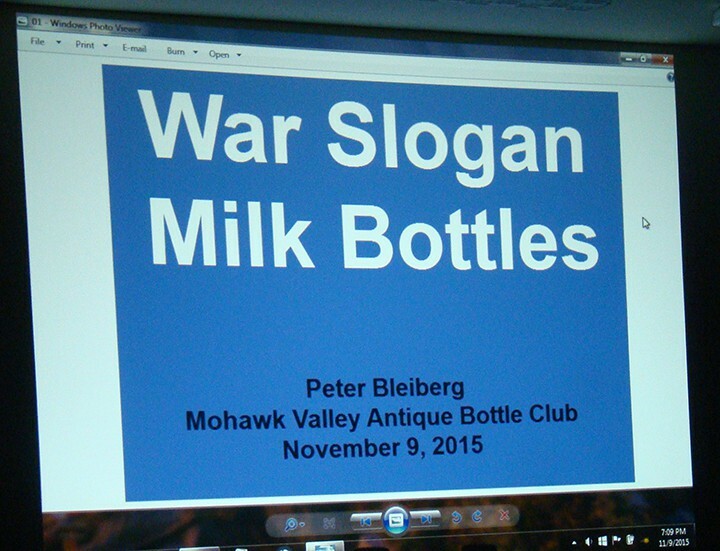 Last night, November 9th, I went to the Mohawk Valley Bottle Club monthly meeting. I attend the meetings as much as I can and normally make 10 or so a year. I was honored to serve as the clubs President for a term and really enjoyed it a lot. There are always a steady 30 people or so that attend the meetings. 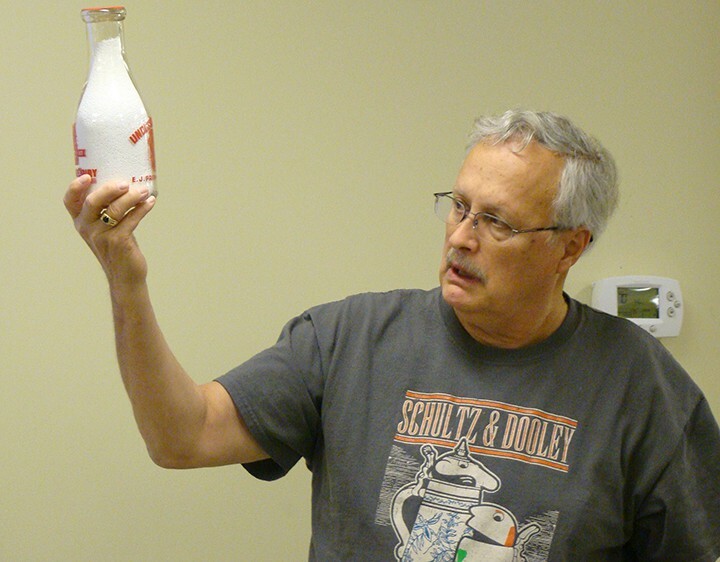 The Mohawk Valley Bottle Club was founded in 1994. A monthly newsletter is published by Jon Landers, one of the founders. Jon has never missed an issue I have been told. 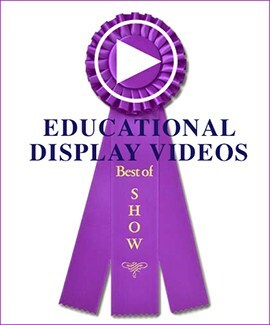 The current President is Kathy Capozzella, Vice President is Dave Mount, Treasure is Peter Bleiberg and Secretary is Debra Rehm, Newsletter Editor Jon Landers, Historian Kevin Gallagher, Photographer Polly Blunk, Programs Ron Weir, Raffles Tom Andriah, Refreshments Dan & Amelia Weeden, Sunshine, Bernice Szblak . 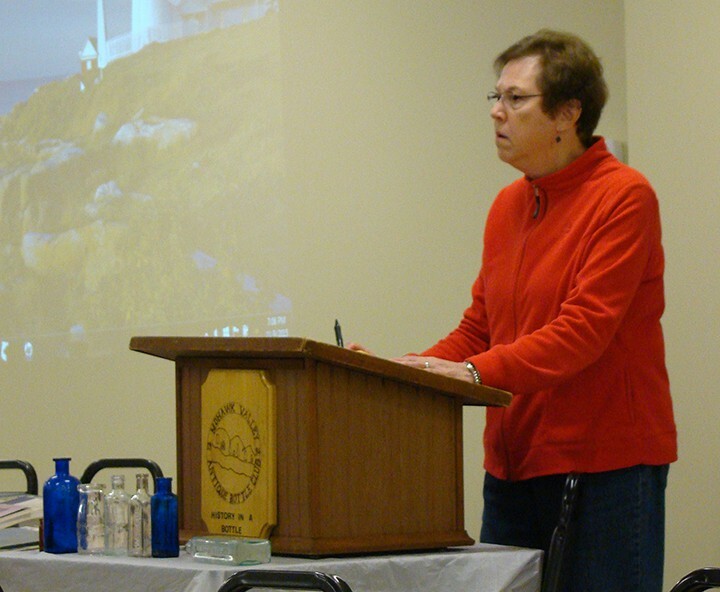 Kathy Capozzella, club President, opens the meeting. The club hosts a web site at Mohawkvalleybottleclub.com. There are some great stories in the archives file, check it out. Dues are $12 single and $15 for a family. 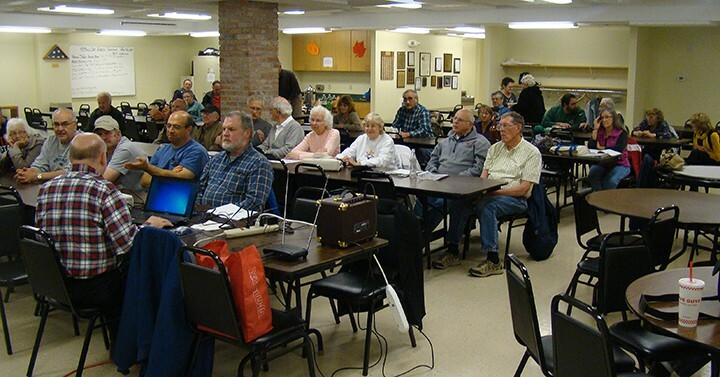 Meetings are held the second Monday of each month at 7:00 pm in New York Mills. I decided to share what last nights meeting was like. I got there about 6:30 to bring in the snacks that Linda had made for me to share and set up my War Slogan milk bottles for Show and Tell. Every month, two different people bring in snacks for everyone during the break of the meeting. It was my turn to bring in something. Linda made chocolate chip cookies, apple crumb cake and fruit salad. Along with the brownies and sugar cookies brought by the other members, snack time was great. Each mouth there is a business meeting, show and tell, raffle and featured speaker. 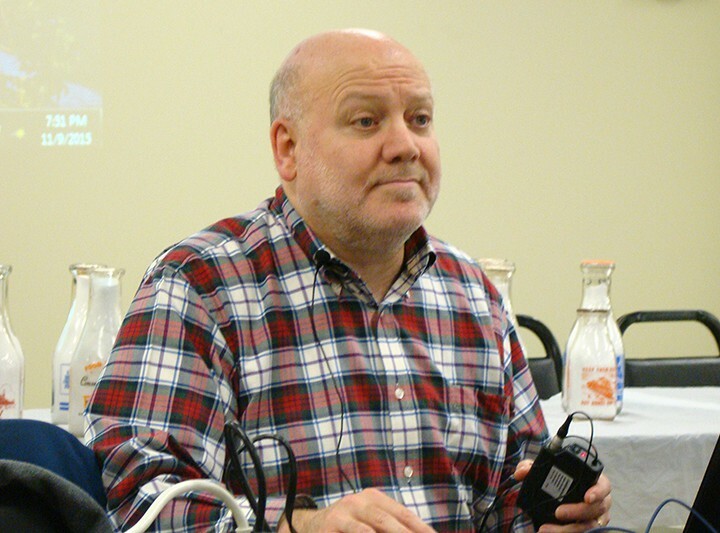 This month’s speaker was Peter Bleiberg the club Treasurer. Peter has a great collection of Pyro Milk Bottles. His collection contains bottles of all kinds but tonight he would focus on War Slogan milk bottles. 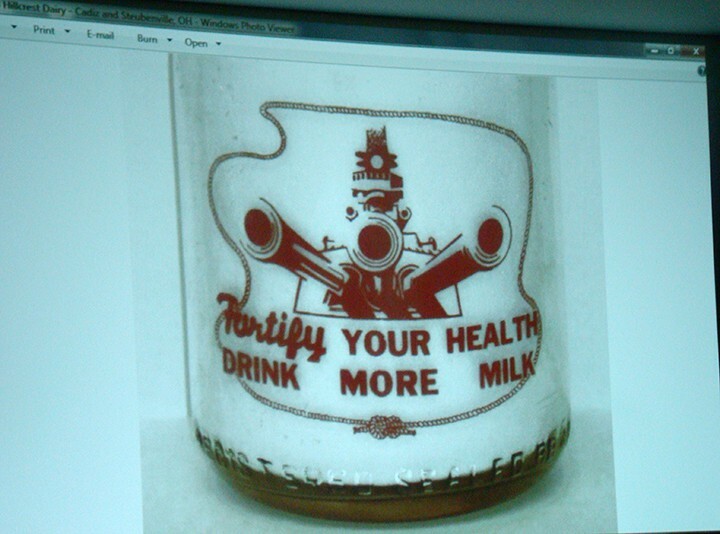 Years ago, during one of my first meetings I attended, Peter did a talk on collecting milk bottles. 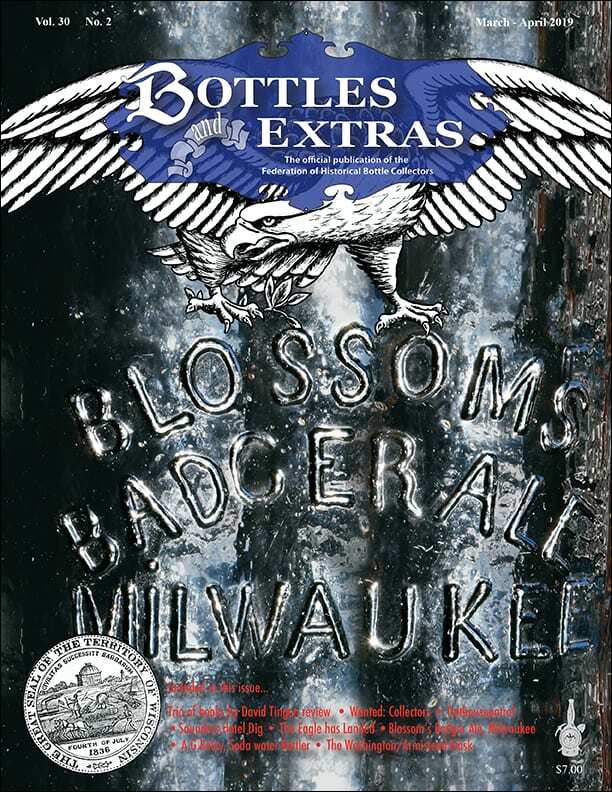 I was an old bottle collector of blown glass and did not really think much of milk bottles. So Peter put on his milkman jacket and hat and started to talk about the history of milk bottles. He had brought along some beautiful designs on bottles from his collection. That night as I drove home, I started thinking about what he had said and he really had opened my mind up about milk bottles. 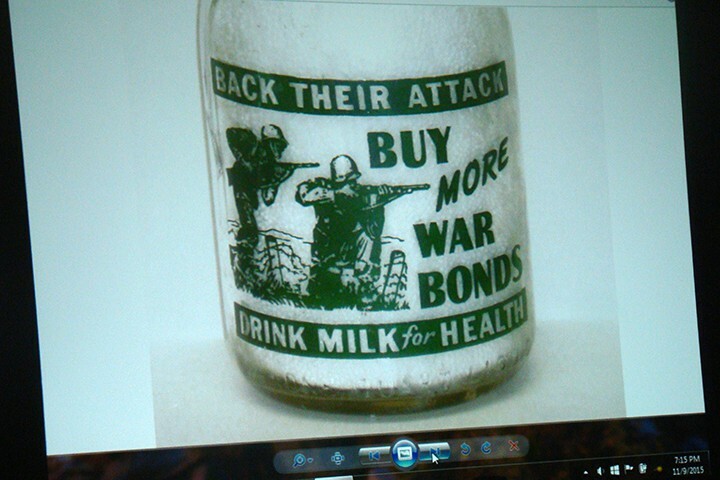 So I started to collect War Slogan milk bottles. The history of these bottles and the time in our countries history when they were used is very important. These are the modern version of a historical flask. Club members waiting for the show to start. 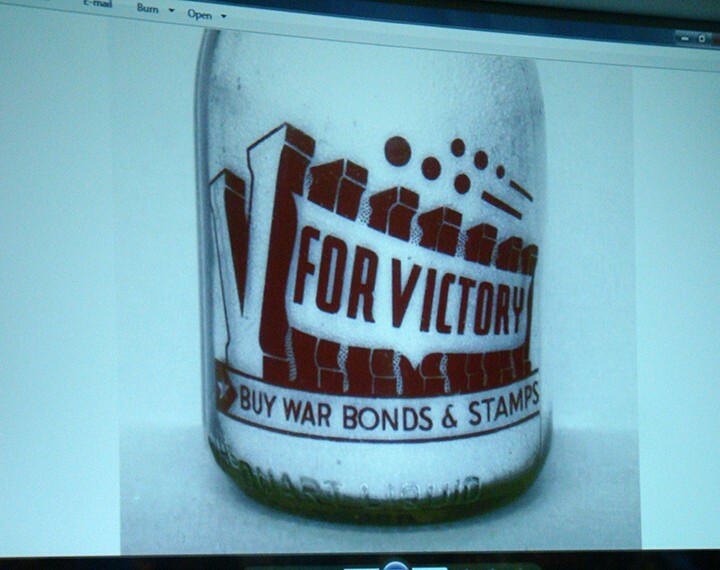 So tonight Peter was back to do another talk, this time just about War Slogan milk bottles which fit in nice with Veterans Day, being Wednesday. As times change, so do the way we do talks. This time rather than boxes of bottles and a guy in a jacket and hat, Peter was armed with a big screen and a laptop loaded with a PowerPoint presentation. I must say, it was a lot easier to see a bottle three feet tall on a screen than a bottle held up by hand where you really could not see anything. 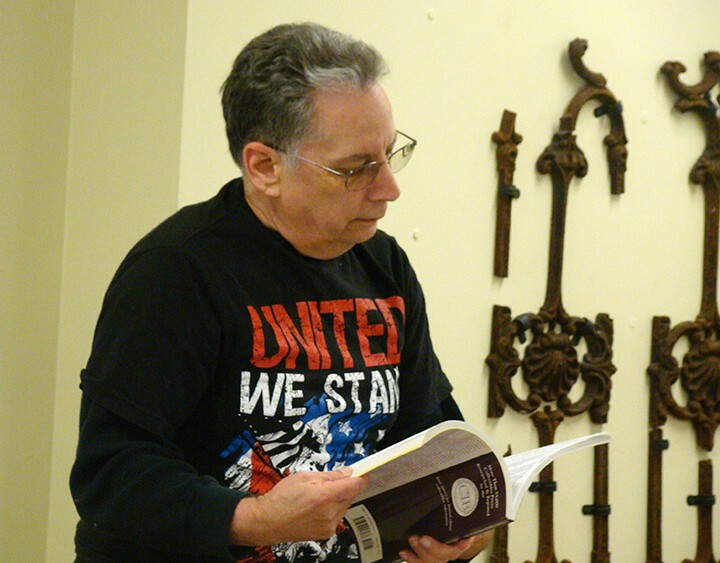 He broke the presentation down into eight chapters as follows; Fighting Men, Fighting Machines, Uncle Sam, V for Victory, The Home Front, Buy War Bonds, A Special War Series and Patriotic Slogans. I have included a few photos from each. To include everything would be too much. Peter is a good speaker and wore a microphone so all could hear as we sat in a dimly lit room so the photos on the screen where bright. The photos I took were a bit of a challenge as I could not use a flash and had to try to focus as the screens changed. Still it was well worth it. I took about two hundred photos and can only share a sample of what there was to see. 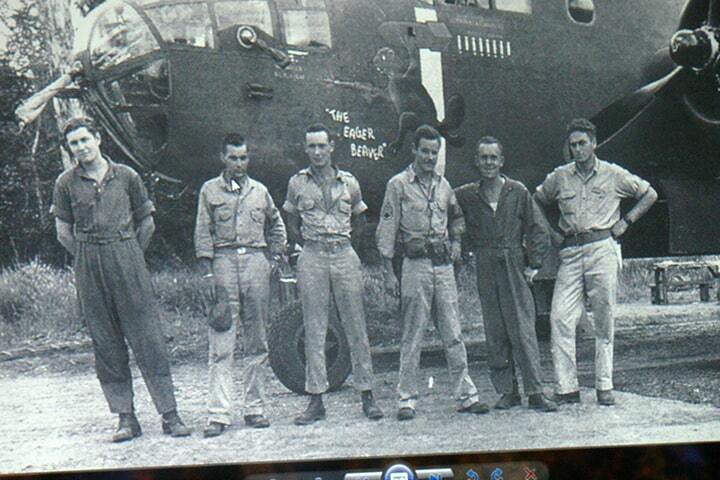 At the end of the show, Peter put an old black and white photo of a group of men standing in front of a bomber marked “The Eager Beaver.” It was taken in 1943 at Port Moresby, New Guinea. If you look at the photo, the man second from the left, is FOHBC Hall of Fame member and Mohawk Valley Club member Howard Dean. Howard will be celebrating his 98 birthday soon and a card was passed for him. If you have ever met Howard, you know what a real man is like. He is a gentlemen in every respect and a war hero. Howard also put together a great collection of Saratoga type mineral waters. Happy 98th Howard! 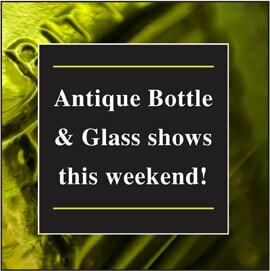 If you want to join a great club with some fantastic people, contact the Mohawk Valley Bottle Club. Everything you need to know can be found on their web page. 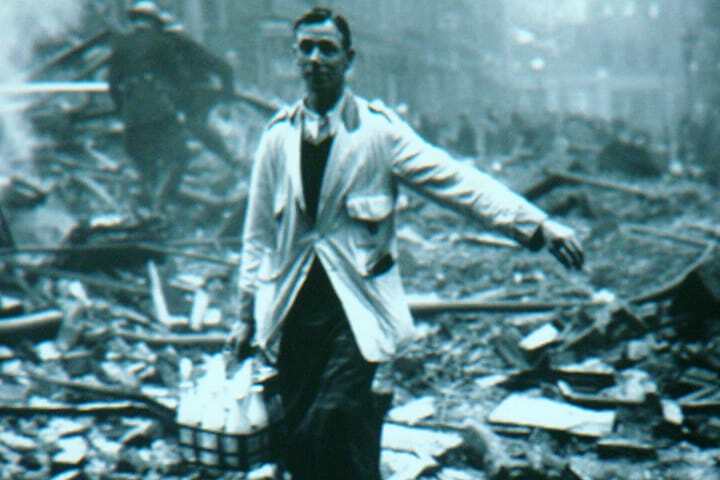 Rare photo of a milk man delivering milk during the war. 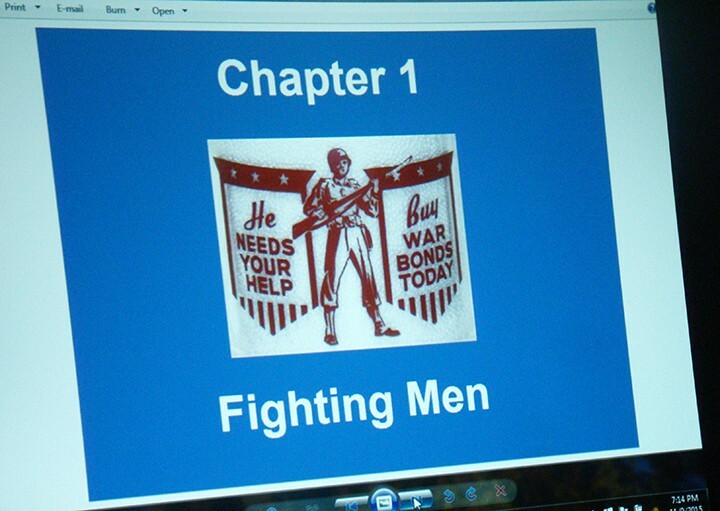 Chapter 1 presentation graphics “Fighting Men” – All 8 chapters had similar graphics. Green Pyro bottle with the “Buy More War Bonds” typography and fighting soldiers graphics. 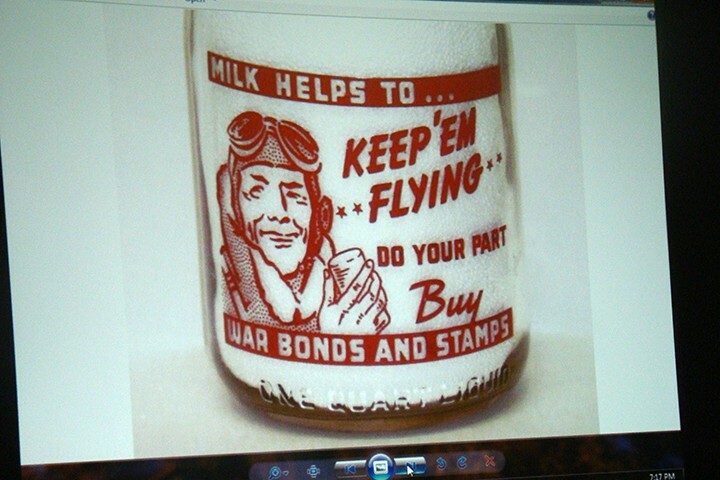 Red Pyro bottle with a pilot and “Milk Helps to … Keep’em Flying” graphics. 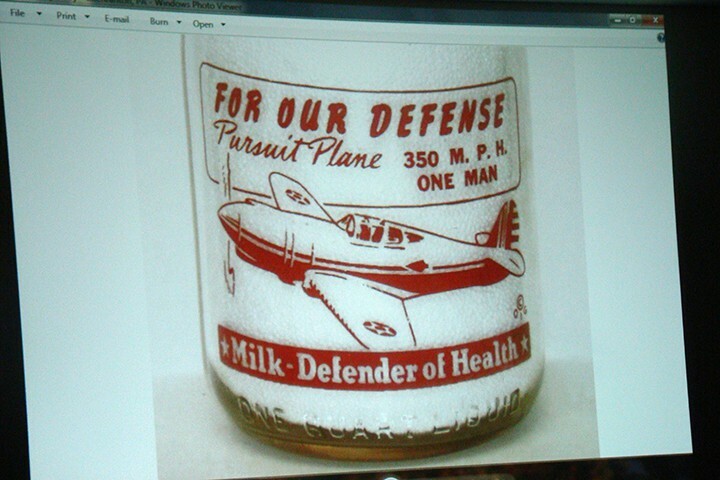 Red Pyro bottle with pursuit fighter plane and “For Our Defense” graphics. Red Battleship bottle – I would love to find a ship bottle. Red “V For Victory” bottle. 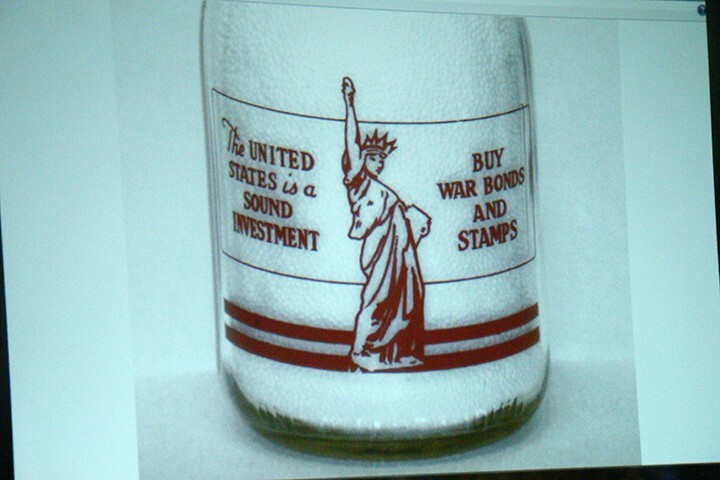 Statue of Liberty bottle with “Buy War Bonds and Stamps” graphics. Photo of Howard Dean – second from the left. Just a great man! Peter Bleiberg taking questions after the show. 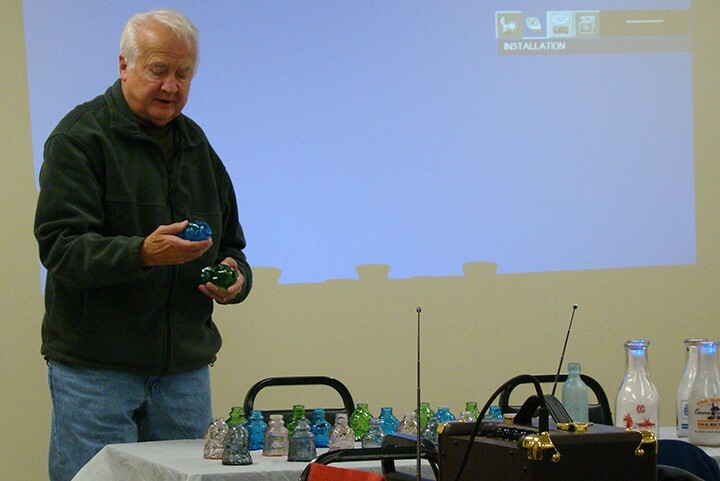 Ron Weir sharing some of his Wheaton bottles during Show and Tell portion of the meeting. 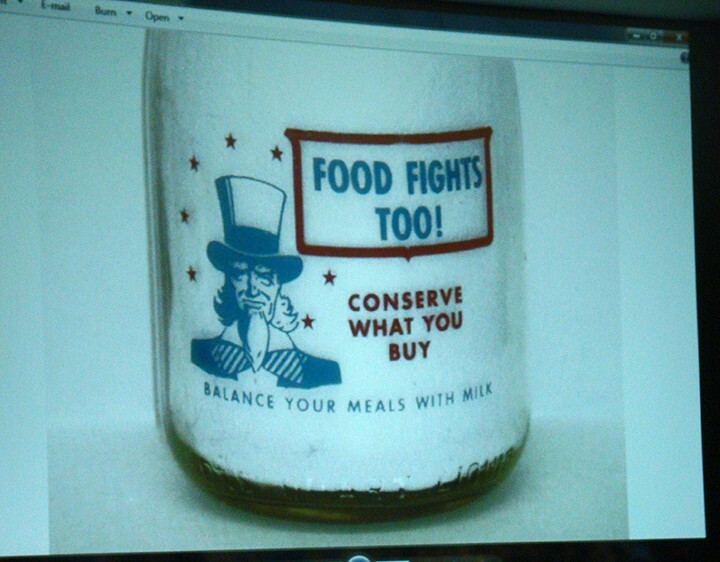 Jon Landers talks about his local war milk bottles during the Show and Tell segment. 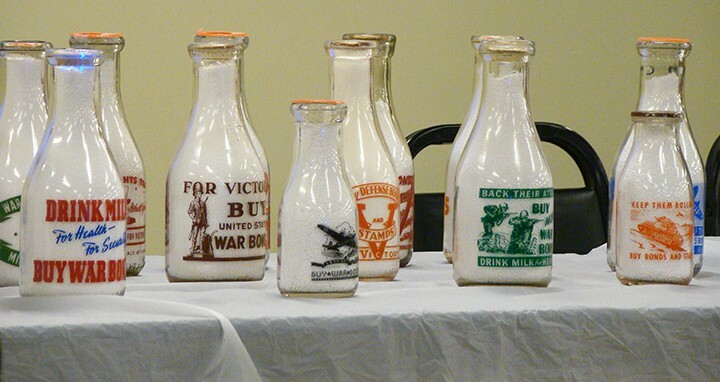 My war milk bottles I brought to share during the Show and Tell.